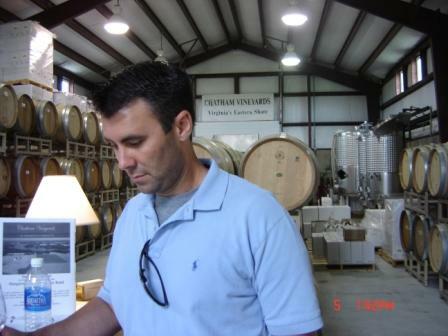 We spent Labor Day weekend on the Eastern Shore of Virginia and stopped by Chatham Vineyards . Virginia’s historic Eastern Shore sits between the Atlantic Ocean and the Chesapeake Bay. If you ever want to get away from it all and take a step back in time, head to Virginia’s Eastern Shore – very, very relaxing along with great Virginia wine. Although I have tried Chatham wines at several wine festivals, this was my first visit to the winery. Chatham turned out to be a pleasant surprise as well as a great break from the in-laws. As part of the tasting, we sampled the Steel aged Chardonnay, Oak aged Chardonnay, Rose, Merlot and Cab Franc. We left with several bottles which I’ll review here as I drink them. 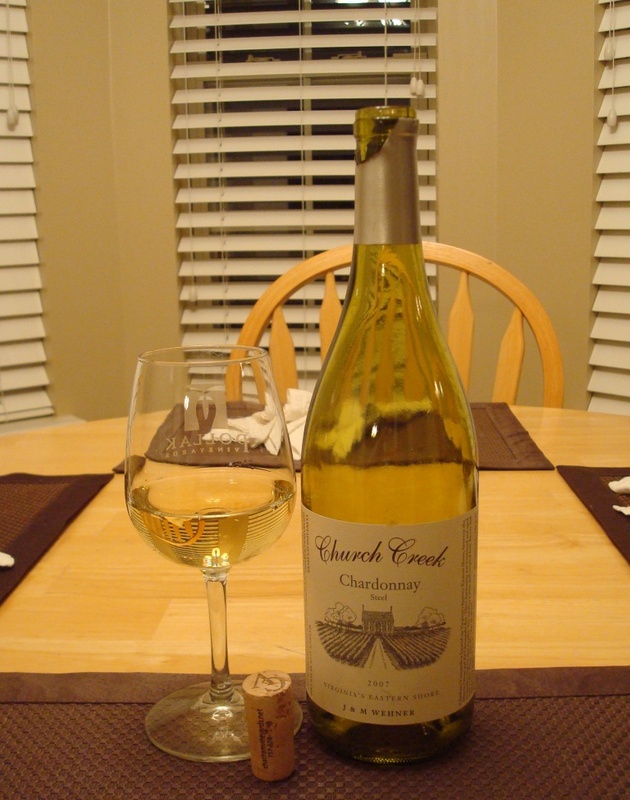 Last night I opened the 2007 Church Creek Chardonnay. Aged in steel. Gold color with tinges of green. $15/bottle. This was a really tasty Chardonnay at this price point. Very fresh and crisp with lemon, citrus and lychee on the nose. Crisp acidity with green apple and citrus on the palate. The land at Chatham, which overlooks Church Creek, was patented in 1640. The Federal-period brick house, Chatham, was built in 1818 by Major Scarborough Pitts and named for William Pitt, the Earl of Chatham and friend of the American Revolution. The historic outbuildings, barns and two early 1900s homes on the property have been renovated in recent years. Chatham Farm has been a working farm for four centuries. Chatham currently produces a couple thousand cases of wine. Hi Gene: I would first check the ‘Virginia Wine’ section of Total Wine in VB out on Laskin Road. Next, you may want to check at Grape & Gourmet on VB Blvd in Lohman’s Plaza. Had a glass of Church Creek chardonnay at New Heights in DC last night. Terrific! Do you know where I can buy it in NW DC? Thanks.